Robert Cleckler Bowden (born November 8, 1929) is a retired American football coach. He coached the Florida State Seminoles football team from the 1976 to 2009 seasons. 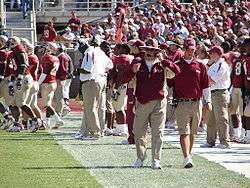 During his time at Florida State, Bowden led FSU to an Associated Press and Coaches Poll National Title in 1993 and a BCS National Championship in 1999, as well as twelve Atlantic Coast Conference championships since FSU joined the conference in 1991. After a difficult 2009 season and amid questioning fans, Bowden stepped down, just weeks after his 80th birthday. But he was allowed to make his final coaching appearance in the 2010 Gator Bowl game on January 1, 2010, with a 33–21 victory over his former program, West Virginia. 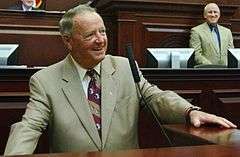 On the day of March 6, 2009 NCAA ruling requiring Florida State to "vacate wins for any games in which an ineligible player participated", threatened to remove as many as 14 of Bowden's wins from the 2006 and 2007 seasons in relation to an academic scandal. Florida State appealed the ruling, but the NCAA upheld it on January 5, 2010. 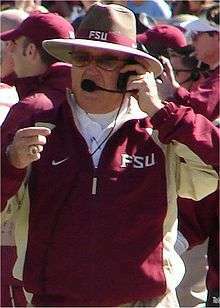 Upon final investigation by Florida State University it was determined that Bowden was to vacate 12 wins, bringing his final career record to 377–129–4. Born in Birmingham, Alabama, Bowden spent a portion of his childhood in bed, sick. Bowden is the son of Bob Bowden and Sunset (née Cleckler) Bowden. When he was 13 years old, Bowden was diagnosed with rheumatic fever. After a six-month hospital stay, Bowden was confined to his bed at home for just over a year with nothing more than his imagination to pass the time. It was listening to World War II reports on the radio that began Bowden's interest in the war, an interest he still has to this day. It was also around this time that his love for football increased, as he would listen to University of Alabama football on Saturday mornings. Bowden was an outstanding football player at Woodlawn High School in Birmingham, and went on to play for the University of Alabama as a quarterback, fulfilling a lifelong dream to play for the Crimson Tide. He then returned to Birmingham and married his high school sweetheart, Ann Estock, on April 1, 1949. Today, the couple have six children and 21 grandchildren. Bobby transferred to Howard College (now Samford University), where he played football, baseball, ran track and became a brother in Pi Kappa Alpha. In his junior year he was elected president of Pi Kappa Alpha. That year his Alpha Pi chapter recorded the highest grade point average in the nation among all Pi Kappa Alpha chapters. His senior year he was reelected to the presidency as well as captain of the football team where he garnered All-American honors at quarterback. The Howard College faculty nominated him for Who's Who Among Students in American Universities & Colleges in recognition of his academic and athletic leadership. Bowden graduated from Howard in 1953. Bowden served as an assistant football coach and head track and field coach at Howard College (now known as Samford University, currently in the FCS football division) in Birmingham, Alabama from 1954–55. He left his alma mater to become Athletic Director as well as head football, baseball, and basketball coach at South Georgia College from 1956 to 1958. Bowden then returned to Howard as head coach, where he compiled a 31–6 record between 1959 and 1962. In 1962, Bowden went to Florida State University as an assistant coach under Head Coach Bill Peterson. Three other coaching legends who worked under Coach Peterson during this time were Bill Parcells, Joe Gibbs and Don James. Bowden left Florida State in 1965 to go to West Virginia University as an assistant under Jim Carlen. When Carlen left following the 1969 season to become head coach at Texas Tech, Bowden replaced him. Bowden then compiled a 42–26 record at WVU before returning to FSU as head coach in 1976. During Bowden's first year as head coach at WVU, the football team of the state's other top-division school, Marshall University, fell victim to a tragic plane crash. Bowden asked NCAA permission to wear Marshall jerseys and play Marshall's final game of the 1970 season against Ohio, but was denied. In memory of the victims of the crash, Mountaineers players put green crosses and the initials "MU" on their helmets. Bowden allowed Marshall's new head coach Jack Lengyel and his assistants access to game film and playbooks to acquaint themselves with the veer offense, a variation of the option offense which aids teams with weak offensive lines. Lengyel credits Bowden with helping the young Thundering Herd recover. Bowden reportedly became emotional while viewing the movie We Are Marshall, and has said that he was the original candidate for the Marshall head coaching job vacated by crash victim Rick Tolley. Bowden became the head coach of the Florida State Seminoles because the climate was warmer than in Morgantown, and because Tallahassee was closer to Birmingham, Alabama, where his mother and mother-in-law both lived. The team had a 4–29 record over the previous three seasons, and Bowden planned to stay only briefly before taking a better job, perhaps as head coach at Alabama. During his 34 years as Florida State's head coach he had only one losing season–his first, in 1976–and declined head coaching job offers from Alabama, Auburn, LSU, and the National Football League's Atlanta Falcons. From 1987 to 2000 the Seminoles finished every season with at least 10 wins and in the top 5 of the Associated Press College Football Poll, and won the national championship in 1993 and 1999. Bobby is not the only member of his family to have coached Division I-A football. His son Tommy Bowden was the head coach at Clemson University. Another son, Terry Bowden, was the head coach at Auburn University, where he was the 1993 Coach of the Year. A third son, Jeff Bowden, was the offensive coordinator at Florida State. All three Bowden men who were head coaches have achieved an undefeated season: Terry in 1993 at Auburn; Tommy in 1998 at Tulane; and Bobby in 1999 at Florida State. Bobby's 1993 and 1999 Florida State teams were the only ones to win a National Championship, however. Terry and Jeff currently coach at the University of Akron. On March 21, 2010, the Over the Mountain Touchdown Club of Birmingham, Alabama presented the first annual Bobby Bowden National Collegiate Coach of the Year Award, named in honor of Bowden and the contributions that he made during his career. The award recognizes a coach each year with unmatched success on and off of the field in the same attributes that Coach Bowden showed throughout his career: Perseverance, Attitude, Integrity, and Determination. University of Alabama head coach Nick Saban was the first recipient of the award that was presented by Bobby Bowden himself. The award is presented each year after national signing day and before the commencement of Spring practice. In 2004, the Fellowship of Christian Athletes presented the first of what is now a yearly award in Bowden's name. The award was initiated by former Bowden assistant coach Vince Gibson and former Bowden player Vernon Brinson. It honors one college football player for his achievements on the field, in the classroom and in the community. In 2013 the Seminole Tribe of Florida became the official sponsor of the award. The Seminole Tribe of Florida Bobby Bowden Student Athlete of the Year Award is presented each year prior to the College Football Playoff (CFP) national title. "ACC Standings" (PDF). 2006 ACC Football Media Guide. Atlantic Coast Conference. Retrieved 2007-01-10. "Florida State University Coaching Staff" (PDF). 2006 Florida State Football Media Guide. Florida State University Athletics. Retrieved 2007-01-10. "Florida State University Year-By-Year Record" (PDF). 2006 Florida State Football Media Guide. Florida State University Athletics. Retrieved 2007-01-10. "West Virginia University Coaching History" (PDF). 2006 West Virginia Football Media Guide. West Virginia University Athletics. Archived from the original (PDF) on 2006-12-09. Retrieved 2007-01-10. ↑ "Bobby Bowden profile". seminoles.com. ↑ "Florida State Seminoles players sorry scandal could cost Bobby Bowden". ESPN. ↑ "Florida State Seminoles penalty upheld; Bowden faces losing 14 wins". ESPN. ↑ "Bobby Bowden wins last game, but can't beat NCAA". jacksonville.com. ↑ Bobby Bowden – A Great Man... A Great Pike. 25 February 2010 – via YouTube. ↑ The Times-Union. "Movie opens old wounds for Bowden – Jacksonville.com". 1 2 Bowden, Bobby. "A Tenure Longer Than Expected and Shorter Than Desired" The New York Times, 31 August 2010. ↑ "The 700 Club -- Bobby Bowden: A Legacy of Coaching Champions for Christ". ↑ "SFCPressPoint: Alabama's Nick Saban to Receive Coach of the Year Award on United States Sports Academy Campus". ↑ "Archived copy". Archived from the original on 2011-05-25. Retrieved 2011-04-28.